When I first heard about homeschooling, my oldest child was getting ready to enter Kindergarten. When I was young, children went to Kindergarten for half a day. Nowadays, most public schools have full-day programs for 5-year-olds, and I must confess, I was not impressed with the idea of sending my girlie away from me for that many hours per week. 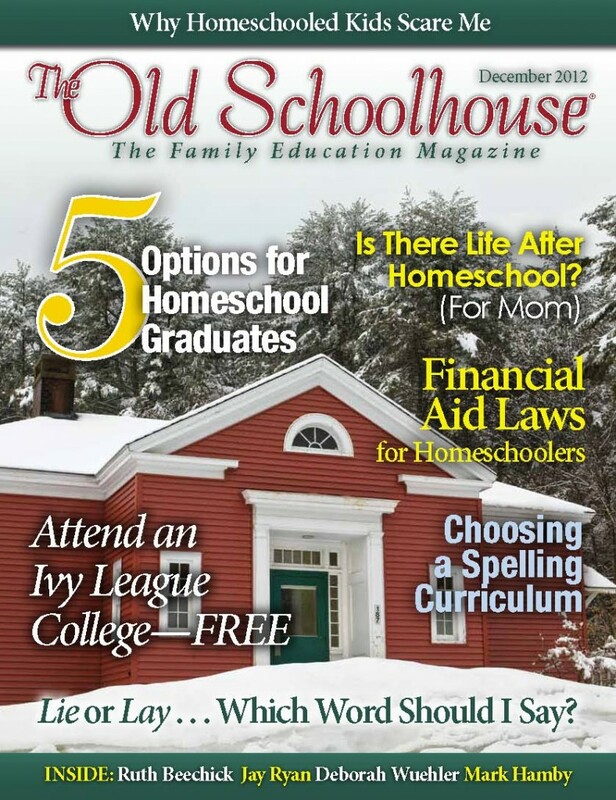 The friend who introduced me to the idea of homeschooling also introduced me to The Old Schoolhouse Magazine. What a blessing it was, when considering homeschooling for the very first time, to read a magazine filled with articles written by people who actually knew what they were doing! I had a subscription, and it was lovely. It's a magazine for Christian homeschoolers, and I appreciated the words of faith and encouragement I found there from people who were in the trenches, so to speak, doing this thing that scared me even as I knew God was leading me down the path to teach my children at home. Alas, I am *terrible* about reading magazines. I love the idea of them, but somehow, I never quite get around to reading them. After a while, I let my subscription to The Old Schoolhouse Magazine lapse. I tried ripping out the articles I enjoyed, thinking I would file them. Guess what? That never happened either. I ended up recycling everything when the paper mess became too much to deal with. Enter The Old Schoolhouse ELECTRONIC FORMAT! There are some smart people in charge of The Old Homeschoolhouse these days, and not only have they gone paperless, but every issue is FREE. That's right: FREE. You can read to your heart's content online (see The Old Schoolhouse Magazine December issue), or download a free app for your Apple, Kindle or Android device. You can also download a PDF to your computer, if you prefer. I have been reading on my iPad, and it's wonderful. I can bookmark articles, and share them via email, Facebook or Twitter. Since I have the magazine on my iPad, it's easy to take with me, so I can read anywhere, any time. The word grammar sounds scary. And some of it is complex. But it really is not hard. Children use mostly correct grammar as they copy the speech of the people around them. Later on, then, it is fairly easy to learn from grammar books the definitions and rules for grammar. The books just describe what the children already use and understand. I will have to ponder that. I would not say that my children find grammar easy at this point in their education. She suggests that many parents start too early teaching grammar; I don't think it's too early for my girls, who are in 6th & 7th grades, but we're not having an easy go of it. I'm considering looking for a different program, even though I was excited about the one I chose. There is an entire article on when to use lie vs. lay ("Lie or Lay . . . Which Word Should I Say? ", p. 68), with an extra inset on effect vs. affect. The very next article is on the parts of speech ("Parts of Speech: Building Blocks of Beautiful Sentences", p. 72), and later on, I found "The Spelling Apologist: Why Good Spelling Is Essential and How to Select the Right Curriculum" (see p. 98). The main focus of the issue is high school: options for homeschool graduates, financial aid, preparing for college - even what a homeschool mom might do when this stage of her life is done. I confess that these articles make me panic a little because I am not quite ready to think about any of my babies leaving home, but with a child in 7th grade, it's not as far off as I'd like to believe. I need to "go there." Perhaps the most fun article for me to read is titled "Astronomy in The Hobbit," written by Jay Ryan, author of Classical Astronomy. The girls and I are currently reading The Hobbit, and are trying to finish before the movie comes out. I'm also trying to establish astronomy as a family hobby. To be honest, I paid no attention to the details discussed in the article, but as I read them, I thought, "How COOL!" and I will most definitely point them out to the girls. I will likely have them read the article, but not until we've read past all the parts mentioned from the book. I don't want to spoil the story! 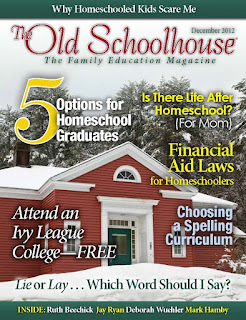 Overall, this is a great magazine for Christian homeschoolers. There are well-written articles of encouragement and information written by people who are well-known in the realm of home education, from all different paradigms: classical, unit study, Charlotte Mason, and so on. There are excellent reviews of curricula and other products that homeschoolers may find useful. I hope you will take a look and see what there might be in it for you. Click the link to check out reviews by The Old Schoolhouse Review Crew!